Two more translation of Ira Chaschina’s interviews. Many Many Thanks my friend catts!!! Today, 13 December, at a press conference in Omsk, Irina Chaschina – the former European and World champion, as well as the current vice-president of the Federation of Rhythmic Gymnastics – amazed everyone with her impressive figure. She shared with BK55 on how to keep fit after leaving sports. – I try to keep in shape all the time. I will say this, when you leave sports, you will eat an extra 10kg of food. I think many gymnasts are like this,’ Chaschina frankly said. ‘I wanted to eat everything that was forbidden in the past. After a few years I looked at myself in the mirror … (smiles). Well, I just became heavy. Since I still perform in galas, I try to go to the fitness club 2-3 times a week. This helps tone the muscles, and the heart take the workload. This has made life easy for me. Also the legendary rhythmic gymnast admitted that, despite her best efforts to stay in good form, she is tempted by delicious food. – When I arrive, my grandmother lays the table with food. I love dumplings the most, especially those stuffed with different types of meat. Generally, in Moscow I have already stayed away from such fatty food. Then Chashina admitted that she does not limit herself seriously in the face of the food. – I do not follow a special diet. It is not like I eat fully for breakfast, and later double that portion for lunch. Everyday I have coffee a few times, then during the day I get a sandwich somewhere. I go around in Moscow the whole day, but not before eating. Sometimes, I cook chicken breast and put together some vegetable salad quickly – she said. Finally, Irina Chashina sighed and said that it is impossible to cook at home. – My husband also goes around the whole day. We meet at the restaurant in the evening. Or, put in an order for a ready meal – she summarized. Take note that Irina Chaschina’s husband is the well-known metropolitan businessman Yevgeny Arkhipov – the vice president of “Northern Expedition”, President of the Russian Federation Canoe Sprint, as well as a friend of the Prime Minister Dmitry Medvedev. According to her, “it was not developed further.” But there stands a school of rhythmic gymnastics for children in Barnaul. 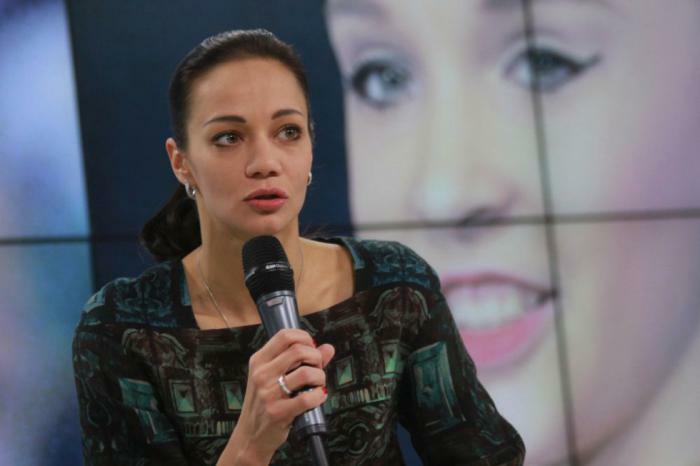 Today, 14 December, the former European and World champion and the current vice-president of the Federation of Rhythmic Gymnastics Irina Chaschina did not reveal the details why she did not open a RG school in her name in Omsk. – Once we and the last governor (Leonid Polezhaev) talked, and there was a desire to open a RG school. But the idea was not developed further – Chaschina reservedly said without giving any reasons. – But to be able to come and watch the tournament in March is also a nice occasion to look at the talented children. We have a lot of them here. The vice-president of the Federation of Rhythmic Gymnastics was more prepared to talk about her own RG school in Barnaul. – I consider it my duty to go to the RG school in Barnaul to help with rules and with its access to the Rhythmic Gymnastics Federation,’ said Chaschina. ‘We do not have much foundation, but have created the conditions. We have managed to gather nearly 200 children in a basement. The children are getting good results. Take note that the information about Irina Chaschina opening a RG school in Omsk was overly exaggerated in the media in 2005. It was mere talk with no practical progress. But in 11 May 2013 Chaschina opened a RG school in Barnaul. This entry was posted in Translation and tagged Ирина Чащина, interview, Irina Chaschina, Irina Chashchina, Irina Tchachina. Bookmark the permalink.